Born in Hannover in 1825, Henne migrated to Victoria and obtained a job at the Melbourne Botanical Gardens working as an assistant to Fedinand Mueller. Henne was the botanist on Landsborough's Queensland Rescue Expedition and travelled on the HMcss Victoria under Commander Norman. He left Melbourne on the HMcss Victoria on Sunday, 4 August 1861 and travelled via Brisbane to Sweers Island. His diary (in German) is in the Mitchell Library (See:	'Journal of Diedrich Henne, 4 August 1861-1 April 1862' ML C407, State Library of New South Wales). Henne died in North Sydney in 1913 and was buried at Gore Hill Cemetery. Henne collected six cases of botanical specimens while on the Queensland Rescue Expedition of 1861-2, including specimens collected by Commander Norman and William Landsbourough. He collected at Sweers Island, the Albert River and at various landfalls along the way. He collected a species of fig on Booby Island in September 1861 which Mueller named Ficus Henneana after him. Henne had hoped to travel overland to Central Mount Stuart and then Melbourne with Landsborough, but Landsborough declined to take the botaninst, citing a shortage of provisions due to the sinking of Captain Kirby's S.S. Firefly. Henne spent much of his time in the Gulf at the base camp on Sweers Island. He tended to Mr Law and Mr Frost, both of whom suffered accidental gunshot wounds. Frost died on 31 December 1861 and was buried on Sweers Island. Henne left the island on the Vcitoria on 12 February 1862 and arrived at Williamstown on 30 March 1862. Friday 7 February 1913, page 5. On January 21 there died Diedrich Henne, aged 78 years, botanical collector, and last survivor of the Landsborough Relief Expedition of 1861. He was buried at Gore Hill Cemetery on the following day. Landsborough's party went by sea In search of Burke and Wills, and was conveyed in the Victorian warship Victoria (Captain Norman) from Melbourne to Brisbane, thence to the Gulf of Carpentaria. Landsborough established his main camp or depot at Sweer's Island, went up the Albert River to the junction of Norman River, and established a depot at the hulk of the Firefly at this spot. Mr Henne was born at Hanover in Germany, and became an assistant to Baron von Mueller in the Melbourne Herbarium. By him he was nominated as botanist collector to Landsborough's expedition. He brought six cases of botanical specimens, which were deposited in the Melbourne Herbarium. Shortly after his return from the expedition he entered into mercantile pursuits, and was 18 years honorary treasurer to the Melbourne Liedertafel. For many years past he has been living quietly in North Sydney, where he passed away after a brief illness. Ficus Henneana, a handsome native fig in coastal Queensland and New South Wales, commemorates him, and I have seen letters which show how highly Baron von Mueller held him in esteem for his personal qualities. I think a record of the old botanical explorers should be kept, and therefore I send I this brief note for your Information. 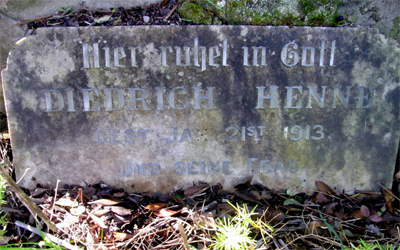 Henne's grave in Gore Hill Cemetery, North Sydney, NSW.